This article is about rulers of North Korea since 1948. For rulers of Silla, see Kim (Korean name) § Gyeongju. The Kim dynasty, referred to in North Korea as the Mount Paektu Bloodline, is a three-generation lineage of North Korean leadership descended from the country's first leader, Kim Il-sung. In 1948, Kim came to rule the North after the end of Japanese rule in 1945 split the region. He began the Korean War in 1950 in an attempt to reunify the Korean Peninsula. In the 1980s, Kim developed a cult of personality closely tied to their state philosophy of Juche, which was later passed on to his two successors: his son Kim Jong-il and grandson Kim Jong-un. Unlike governance in all other socialist countries, North Korea's governance is comparable to a royal family. The Kim dynasty has ruled North Korea since 1948 for three generations, and still little about the family is publicly confirmed. Kim Il-sung rebelled against Japan's rule of Korea in the 1930s, which led to his exile in the Soviet Union. Korea was divided after Japan's defeat in World War II. Kim came to lead the Soviet-backed North's provisional government, becoming the first premier of its new government, the Democratic People's Republic of Korea (commonly known as North Korea), in 1948. He started the Korean War in 1950 with hopes to reunify the region. Kim developed a personality cult that contributed to his uncontested 46-year rule and extended to his family, including his mother Kang Pan-sok (known as the "mother of Korea"), his brother ("the revolutionary fighter") and his first wife (the "mother of the revolution"). The strong and absolute leadership of a solitary great leader, known as the Suryong, is central to the North Korean ideology of Juche. Four years after Kim Il-sung's 1994 death, a constitutional change wrote the presidency out of the constitution and named him as Eternal President of the Republic in order to honor his memory forever. 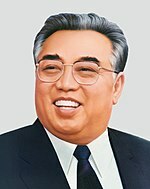 Kim Il-sung was known as the Great Leader, and his eldest son and successor, Kim Jong-il, became known as the Dear Leader and later the Great General. Kim Jong-il was appointed to the party's Politburo (and its Presidium), Secretariat and the Central Military Commission at the 6th Congress in 1980, which formalized his role as heir apparent. He led their military beginning in 1990, and had a 14-year grooming period before he became North Korea's ruler. Kim Jong-il had a sister, Kim Kyung-hee, who was North Korea's first female four-star general and married to Jang Sung-taek, who was the second most powerful person in North Korea before his December 2013 execution for corruption. Kim Jong-il had four partners, and at least five children with three of them. His third son, Kim Jong-un, succeeded him. Scholar Virginie Grzelczyk wrote that the Kim Dynasty represented "one of the last bastions of totalitarianism as well as perhaps 'the first Communist Dynasty'". The North Korean government denies that there is a personality cult surrounding the Kims. Rather, it claims that the people's devotion to the Kims is a manifestation of genuine hero worship. The Kim dynasty (Kim Il-sung, Kim Jong-il and Kim Jong-un) has been described as a de facto absolute monarchy or "hereditary dictatorship". Kim Il-sung was born in Mangyongdae-guyok to Methodist parents. His father Kim Hyong-jik was 15 when he married Kang Pan-sok two years his elder. Kim Hyong-jik had attended a school founded by Protestant missionaries, which influenced his own family. Kim Hyong-jik became a father at the age of 17, and left school to work as a teacher in a nearby school he once attended. He later practiced Chinese herbal medicine as a doctor. Kim Hyong-jik protested against Japanese rule, and was arrested several times for his activism. He was a founding member of the Korean National Association in 1917, participated in the 1919 March 1st Movement, and fled Korea for Manchuria with his wife and young Kim Il-sung in 1920. There is a teacher's college named for him in Pyongyang. Kim Hyong-jik's own parents, Kim Bo-hyon and Li Bo Ik, were likened as "patriots" by the Editorial Committee for the Short Biography of Kim Il-sung. Kim Il-sung married twice and had six children. He met his first wife, Kim Jong-suk, in 1936, and she bore Kim Jong-il, Kim Man-il, and Kim Kyong-hui before dying while bearing a stillborn daughter. Kim Jong-suk was born 24 December 1917 in Hoeryong in (North) Hamgyo’ng Province. Her family and she fled Korea to Yanji, Jilin (Kirin) Province around 1922. In October 1947, Kim Jong-suk presided over the establishment of a school for war orphans in South P’yo’ngan Province, which became the Mangyo’ngdae Revolutionary School. When the school opened in west Pyongyang one year after its foundation, Kim Jong Suk also unveiled the country's first statue to Kim Il-sung. In 1949, Kim Jong-suk was once again pregnant. She continued public activities, but her health diminished. She died on 19 September 1949 due to complications from pregnancy. Kim Il-sung had three children with his second wife, Kim Song-ae: Kim Kyong-il (born 1951), Kim Pyong-il (born 1953), and Kim Yong-il (born 1955). He had two younger brothers, Kim Chol-ju and Kim Yong-ju and a sister. When Kim Il-sung's first wife died, Kim Song-ae was not recognized as Kim Il-sung's wife for several years. Neither partnerships had public weddings. Born Kim So’ng-p’al in the early 1920s in South P’yo’ngan Province, Kim Song Ae began her career as a clerical worker in the Ministry of National Defense where she first met Kim Il Sung in 1948. She was hired to work in his residence as an assistant to Kim Jong Suk. In addition to doing secretarial work for the Kims, she also looked after Kim Jong Il and Kim Kyong Hui. After Kim Jong Suk’s 1949 death, Kim Song Ae began managing Kim Il Sung’s household and domestic life. In 1953, Kim Song Ae gave birth to her first child with Kim Il Sung, a daughter named Kim Kyong Jin (Kim Kyo’ng-chin). She went on to have at least two other children with him, sons Kim Pyong Il (b. 1954) and Kim Yong Il (b. 1957). Kim Kyong-hui became North Korea's first female four-star general. Her husband Jang Sung-taek was the second most powerful person in Korea before his December 2013 execution for corruption. Their 29-year-old daughter overdosed on sleeping pills in 2006 while in Paris. It has also been reported that Kim Young Il, who was dispatched to serve in Germany, died from cirrhosis of the liver in 2000. Kim Jong-il had four partners, and at least five children with three of them. He fathered Kim Jong-nam in 1971 with film star Song Hye-rim, and Kim Sul-song in 1974 with his first wife, Kim Young-suk. His second mistress, Ko Yong-hui, was the "de facto First Lady of North Korea". She was born in Japan to a Korean father and Japanese mother. Their three children are Kim Jong-chul (born 1981), Kim Jong-un (born 1983), and Kim Yo-jong (born 1987). He did not have children with his fourth partner, Kim Ok. The two half-brothers Kim Jong-un and Kim Jong-nam never met, because of the ancient practice of raising potential successors separately. From the early 1980s onward, Kim Jong-il dichotomized the Kim Family between its main, or central, branch (won kaji) and its side, or extraneous, branch (kyot kaji). The main branch referred to Kim Il-sung’s family with Kim Jong-suk and publicly included Kim Jong-il and Kim Kyong-hui. The side branch referred to Kim Il-sung’s family with Kim Sung-ae and included the three children from their marriage. Kim Jong-un's two older brothers were considered "black sheep" of the family. Kim Jong-nam, Kim Jong-il's eldest son, fell out of favor when caught in a plot to visit Tokyo Disneyland in 2001. 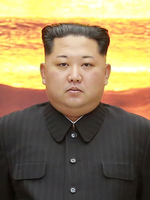 He had a reputation as a troublemaker within the family, and publicly stated in 2011 that North Korea should transition out of his family's dynasty. On 14 February 2017, South Korean media reported that Kim Jong-nam was assassinated with the deadly chemical weapon VX at Kuala Lumpur International Airport in Malaysia by two unidentified women, suspected to be North Korean agents. It is still not clear how the lethal dose was delivered. Some reports suggest needles, others a spray, or a cloth held to Kim’s face. Kim Jong-nam was survived by his wife and two children. His son, Kim Han-sol, has also criticized the regime. In an interview with Finnish media in 2012, Kim Han-sol openly criticized the reclusive regime and the government saying that he has always dreamed that one day he would return to his homeland to "make things better". Ever since the death of his father, his whereabouts have been unknown. The middle son, Kim Jong-chul, was reportedly not considered in succession considerations due to his unmasculine characteristics. He is also known to be reserved. Kim Jong-un became North Korea's Supreme Leader on December 29, 2011. He married Ri Sol-ju in either 2009 or 2010, and the couple reportedly had a daughter, Kim Ju-ae, in 2012. His sister Kim Yo-jong had fallen out of favour with her brother for a few years but in 2017, she was elevated by Kim Jong-un to the powerful Central Committee of the Workers' Party of Korea. Kim Jong-un made an effort to distinguish himself from the reputations of his father and brothers, and has promoted the image of an academic who possesses a masculine and extroverted demeanor. ^ a b c "Next of Kim". The Economist. The Economist Group. September 23, 2010. Archived from the original on December 27, 2013. Retrieved December 27, 2013. ^ "Kim tells N Korean army to ready for combat". Al Jazeera. Al Jazeera Media Network. December 25, 2013. Archived from the original on December 28, 2013. Retrieved December 27, 2013. ^ Mullen, Jethro (September 9, 2013). "Dennis Rodman tells of Korea basketball event, may have leaked Kim child's name". CNN. Archived from the original on December 28, 2013. Retrieved December 27, 2013. ^ a b c d Milevsky, Avidan (April 12, 2013). "Dynamics in the Kim Jong Family and North Korea's Erratic Behavior". The Huffington Post. AOL. Archived from the original on December 28, 2013. Retrieved December 27, 2013. ^ a b c d e "Kim Il-Sung (president of North Korea)". Encyclopædia Britannica Online. Encyclopædia Britannica, Inc. 2013. Archived from the original on December 29, 2013. Retrieved December 29, 2013. ^ Lee 2004, p. 1–7. ^ a b Choe, Sang-hun (October 25, 2013). "Following Dear Leader, Kim Jong-un Gets Title From University: Dr. Leader". The New York Times. Archived from the original on December 29, 2013. Retrieved December 29, 2013. ^ Kim 1982, p. 142. ^ "Kim Jong Il (North Korean political leader)". Encyclopædia Britannica Online. Encyclopædia Britannica, Inc. 2013. Archived from the original on December 29, 2013. Retrieved December 29, 2013. ^ a b c d e f g h "North Korea's secretive 'first family'". BBC News Asia. BBC. December 13, 2013. Archived from the original on December 27, 2013. Retrieved December 27, 2013. ^ a b Choe, Sang-hun; Fackler, Martin (June 14, 2009). "North Korea's Heir Apparent Remains a Mystery". The New York Times. Archived from the original on December 29, 2013. Retrieved December 29, 2013. ^ Grzelczyk 2012, p. 37. ^ a b c Corfield, Justin (2013). Historical Dictionary of Pyongyang. Anthem Press. pp. 78–79. ISBN 978-0-85728-234-7. ^ Martin 2007, p. 14. ^ Editorial Committee for the Short Biography of Kim Il Sung; Chʻulpʻansa, Oegungmun (1973). Kim Il Sung: short biography. Foreign Languages Publishing House. p. 1. ^ a b c d "Kim Family". North Korea Leadership Watch. ^ a b c "The Kim Family Tree". Time. Time Inc. Archived from the original on 2014-01-02. Retrieved January 2, 2014. ^ Martin 2007, p. 187. ^ a b c d e Shenon, Philip (December 19, 2011). "Inside North Korea's First Family: Rivals to Kim Jong-un's Power". The Daily Beast. The Newsweek Daily Beast Company. Archived from the original on December 27, 2013. Retrieved December 27, 2013. ^ "The Life and Execution of Kim Hyun". Daily NK. 2009-08-10. Archived from the original on 2014-07-14. Retrieved 2014-06-16. ^ Demetriou, Danielle (Feb 17, 2017). "Kim Jong-nam received 'direct warning' from North Korea after criticising regime of half-brother Kim Jong-un". The Telegraph. United Kingdom. Archived from the original on February 18, 2017. Retrieved February 20, 2017. ^ McKirdy, Euan (February 16, 2017). "North Korea's ruling family: Who is Kim Jong Nam?". CNN. U.S. Archived from the original on February 16, 2017. Retrieved February 20, 2017. ^ Park, Ju-min; Sipalan, Joseph (14 February 2017). "North Korean leader's half brother killed in Malaysia". Reuters. Archived from the original on 14 February 2017. Retrieved 14 February 2017. ^ Ryall, Julian; Rothwell, James (14 February 2017). "Kim Jong-un's half-brother 'assassinated in Malaysia by female North Korean spies with poison needle'". The Telegraph. Archived from the original on 14 February 2017. Retrieved 14 February 2017. ^ McCurry, Justin (14 February 2017). "Kim Jong-un's half-brother reportedly killed in Malaysia". The Guardian. Archived from the original on 14 February 2017. Retrieved 14 February 2017. ^ Graham-Harrison, Emma (2017-02-16). "The death of Kim Jong-nam: what we know". The Guardian. ISSN 0261-3077. Archived from the original on 2017-05-20. Retrieved 2017-05-31. Grzelczyk, Virginie (Winter 2012). "In the Name of the Father, Son, and Grandson: Succession Patterns and the Kim Dynasty" (PDF). The Journal of Northeast Asian History. Northeast Asian History Foundation. 9 (2): 35–68. Archived from the original on December 27, 2013. Retrieved December 27, 2013. Kim, Nam-Sik (Spring–Summer 1982). "North Korea's Power Structure and Foreign Relations: an Analysis of the Sixth Congress of the KWP*". The Journal of East Asian Affairs. Institute for National Security Strategy. 2 (1): 125–151. JSTOR 23253510. Lee, Kyo Duk (2004). "The Successor Theory of North Korea". In Son, Gi-Woong. ‘Peaceful Utilization of the DMZ’ as a National Strategy (Report). Korean Institute for National Reunification. ISBN 898479225X. Martin, Bradley K. (2007). Under the Loving Care of the Fatherly Leader: North Korea and the Kim Dynasty. St. Martin's Press. ISBN 978-1-4299-0699-9. Wikimedia Commons has media related to Kim dynasty (North Korea). Buzo, Adrian (1999). The Guerilla Dynasty: Politics and Leadership in North Korea. London: I.B.Tauris. ISBN 978-1-86064-415-3. Lintner, Bertil (2005). Great Leader, Dear Leader: Demystifying North Korea Under the Kim Clan. Chiang Mai: Silkworm Books. ISBN 978-974-9575-69-7.